I’ve always had an affinity for sweets, especially the perfectly proportioned and delicious cupcake. There is something so adorable about this tiny treat, and ever since Sprinkles opened it’s Beverly Hill bakery in 2005 , it seems that the cupcake craze has been in full swing. Now, I love a Sprinkles cupcake – super sweet, rich flavor and it pops out of a pastel pink ATM – however sometimes a healthier homemade confection is in order. 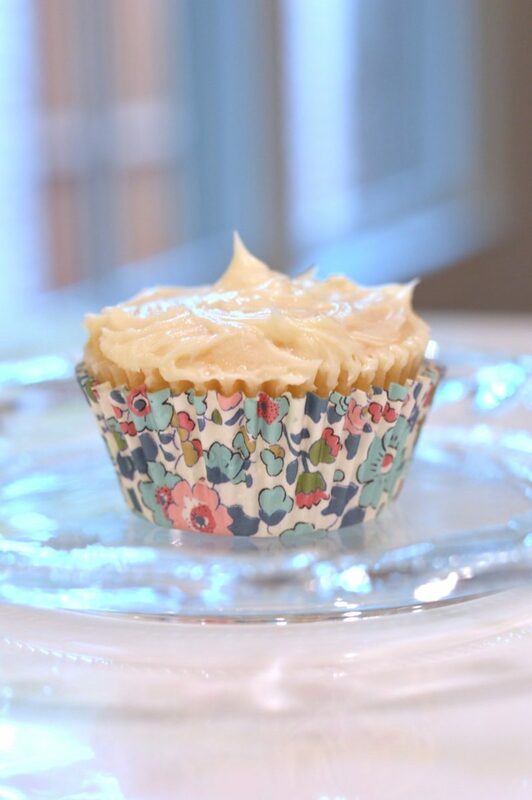 These almond flour cupcakes are sweetened with maple syrup and have a decadent frosting (disclaimer: the frosting does have a good dose of sugar, so you can skip it if need be) that can even be vegan. They are a breeze to make, and paired with a colorful liner and embellished with sprinkles or an edible flower or two, these cupcakes are sure to be a favorite at your house. I’ve included the recipe below, and hope you’ll give them a try! Preheat the oven to 350 degrees and fill a cupcake tin with 12 liners. Using a medium-sized bowl, mix the eggs, oil, maple syrup and vanilla extract until just combined. Add the dry ingredients – almond flour, salt, and baking soda – and mix the batter until everything is well incorporated. Pour the batter into the cupcake liners, and bake for 20-25 minutes or until a toothpick comes out clean. Let the cupcakes cool completely, and then frost them. Using an electric mixer and a medium-sized bowl, combine the powdered sugar, butter, almond milk and vanilla extract. Mix the frosting (medium speed) until its smooth and velvety. If it is too thin, add more sugar and if it is too thick, add more milk.